This “Choosing a Career” section makes you start thinking about YOU! The type of person you are! And what type of job might suit you! answer questions about yourself in an interview to secure the job! After all… you are going to be spending a LOT of time at work, so you really should enjoy it as much as you can LOL!!! 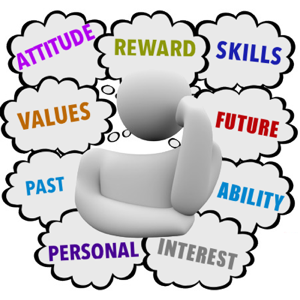 Complete this section, and you’ll find out how to choose a career which suits you, your abilities and your interests! Why all the fuss? Well, most people don’t put much thought into their choice of career. It IS a very complex decision to make… and maybe that turns people off doing what they should. And often they settle for something that doesn’t really suit them. Some honest “soul searching” is a necessary start to career decision making. It helps you to work out what you want and don’t want! And points you in the direction you should be heading, rather than wandering around lost and bumping into dead ends. Could any of your past experiences be USEFUL to you when thinking about your career, or when drawing up your resume? Sometimes employers want potential employees to meet the physical requirements of the job available. In some circumstances however it could amount to unlawful discrimination. Let’s use some common sense here and work out what particular physical requirements might be needed for some jobs… and not others… and why. Employers have been using personality tests with job applicants for years. These help them determine whether they are the right “fit” for the company, the job etc. It should be pretty obvious, but if you don’t have the ability NOR the interest, to DO the tasks involved in a job, you probably shouldn’t be doing it! Most people find it hard to say what things they like or are good at! But this is a very important part of the whole job search process! There are quite a few pages in this section, so please give yourself plenty of time to get through it! To get what you WANT out of life, you must set realistic goals. You must make plans to achieve them. And you must take action! Go on to the next step! And collect some useful Job and Course Information.